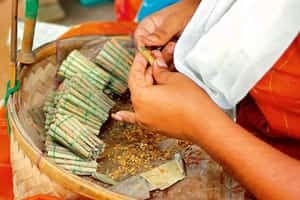 New Delhi: Less than two months after the Union health ministry imposed a ban on smoking in public places, a national association of beedi manufacturers has claimed that as many as one million workers, mostly women, will be fired in the next few months because of falling sales. Beedi is a thin cigarette in which tobacco is rolled in tendu leaves. The All India Beedi Industry Federation has written to Prime Minister Manmohan Singh that the smoking ban has made things tough for the beedi industry. Meanwhile, “we have told the Prime Minister ... that a forced printing of the pictoral (cancer) warning has been made compulsory since 1 December. This will lead to a further decline in sales by 30%," said Rajnikant Patel, president of the federation. “Beedi manufacturers have already started issuing retrenchment notices to the labourers in Maharashtra," said Sudheer Sable, the president of the Maharashtra Beedi Udyog Sangh. According to Ramesh Bhai Somabhai Patel, a manager at one of CeeJay Group’s units in Gondia, beedi sales are down by around 20% on account of the smoking ban. “Things are looking quite bad. At one point, we even wanted to close down but that is impossible on account of the tough laws pertaining to closure. This (smoking) ban has made life quite difficult," said Patel. Ceejay Group employs at least 40,000 labourers across the country and is owned by civil aviation minister Praful Patel. Health minister Anbumani Ramadoss, instrumental in enforcing the ban, was out of India and couldn’t be reached for comment. In another letter, the Maharashtra Beedi Udyog Sangh asked Communist Party of India (Marxist) leader M.K. Pandhe “to persuade the government to rehabilitate the beedi workers and then implement the law (ban)". Pandhe, also the president of Centre of Indian Trade Unions (Citu), however, said the trade union will, however, not lend its support to beedi manufacturers. “People will smoke indoors if they want to and this will not impact their sales," he noted. However, the Communist Party of India (Marxist), the parent party of Citu, would move a Bill in Parliament that would seek to do away with a legislative clause that stipulates embellishing beedi packets with pictorial warning signs, he said. A labour ministry official said that it is difficult to agree with the beedi manufacturers’ view that a ban on smoking in public had hit sales drastically. “People who wish to smoke will do so at home. So where is the question of sales being affected?" asked this official while declining to be named.